Ashley Linebarger Patterson needs your support! 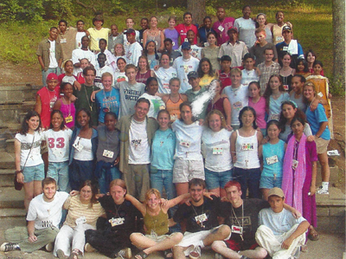 The summer after my freshman year of high school, I was nominated and provided a scholarship to attend a week-long “leadership program.” I agreed to go, but didn’t quite know what I was getting myself into. As I boarded the bus full of mostly strangers and a few familiar faces, I had no idea that I was about to embark on a journey that would change the way I saw the world…but as I got off of the same bus some 7 days later, that is exactly what had happened. Before Everytown, I considered myself to be an open-minded person who was decidedly tolerant of my diverse peers. It was not until after this experience, however, that I realized how easy it was to say and believe these things when I never really had to interact with people who were drastically different from myself. During this week, for the first time in my life, I earnestly engaged with people with whom I was sure I had nothing in common. The Everytown delegates were a microcosm of diversity in terms of race, religion, ability, sexuality, socioeconomic status, gender, nationality, language and a host of other identity points. As we talked in small groups about our families and school experiences, our fears and our celebrations, and the things that made us unique, what we came to find was that in spite of our individuality, our differences were greatly outnumbered by our commonalities. The only way this realization was able to be come by after such a short period of time was that we cared about each other. Truly cared. The atmosphere that Everytown brings alive effectively breaks down the barriers that otherwise disallow us to see each other. With new eyes to see, the world had never before seemed so full of beauty and opportunity. Everytown has given me a number of things…fond memories that bring warm smiles, a reminder of why I am doing the work I am today, a confidence to show others the pride I have in myself with the hope that their sense of pride can shine through as well, and even a best friend. It is now my time to give back and I am thankful for the opportunity. As we fundraise with the commitment to bringing back this dynamic program after almost a decade long hiatus prompted by monetary challenges, I hope you will join me in doing so. Please join me and the Everytown team in our revival efforts…every little bit counts! Thank you for helping me reach my goal of $2,000!